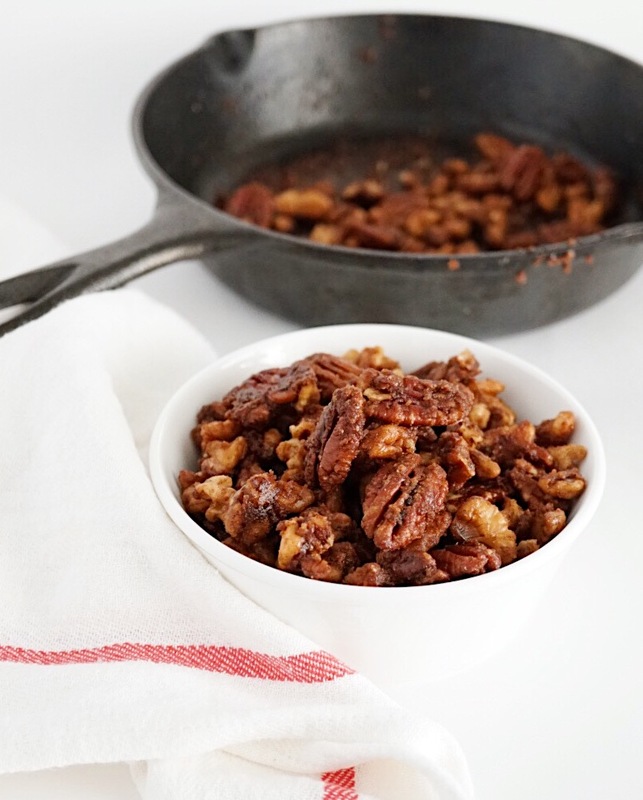 hot candied pecans are one of my all time favorite snacks to get when i see them... or smell them... because it's that smell that i just can't resist.. but they are usually loaded with a ton of refined sugar. this version tastes IDENTICAL to those you'd get at the parks, only they're made with maple syrup and maple sugar and don't contain any refined sugar--making them just a bit healthier for you!! these are also so great to make as a little gift for friends and family--during the holidays, or for a housewarming party, or even just a simple show of appreciation for your loved ones. Make em, pack em into a cute little glass jar, and tie it up with a ribbon or some hemp and voila! oh, and did i mention these only take 5 minutes to make?! seriously, does it get any easier than that?? well, what are you waiting for?! go make some! 1 1 min. 4 mins. 5 mins. *i used Parker's chile infused maple syrup for just a bit of a kick, but regular maple syrup will work just perfectly as well! heat coconut oil and maple syrup in a small cast iron skillet over medium-high heat until it comes to a simmer. turn heat down to low and add pecans. add maple sugar and cinnamon and stir to coat pecans, cooking until the liquid has reduced into a thick, sticky coating. remove from heat and let sit until cool. enjoy! store leftovers in an airtight container. these make a great snack or sweet treat for the whole fam!